Flat handled bags - strong versatile kraft SOS carrier bags, block bottomed so they stand on their own with strong flat handles. 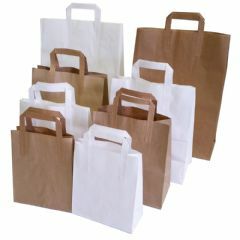 Ideal for takeaways, shops, stores and parties, available in 4 sizes in both brown and white. 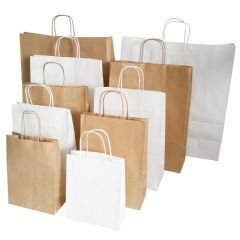 Twisted handled bags - made from very strong ribbed kraft paper, also block bottomed. High quality, great for gift shops and parties, available in 5 sizes in both brown and white.